Sandals Resorts is perfect for couples celebrating a honeymoon, anniversary, destination wedding or one on one quality time together. Sandals Resorts are adult, couples only resorts with an all inclusive package including meals, drinks, water and land sports. Beaches Resorts is the best place to vacation in the Caribbean! Beaches Resorts are for everyone and are especially great for families! Celebrate a destination wedding, family reunion or a BFF getaway. Beaches Resorts offer all inclusive packages including meals, drinks, water and land sports. All-Inclusive Resorts, the Caribbean, Mexico, Atlantis, Disney World, Disney Cruises, and More! The sales agents at Twinsburg Travel are all Sandals and Beaches Resorts platinum agents and are among the few travel agencies in the world that are part of a special Chairman's Royal Club for Sandals and Beaches Resorts. Each resort is very different in style. When trying to figure out which resort is perfect for you, call us at 1-800-514-6789 or email us at info@twinsburgtravel.com. 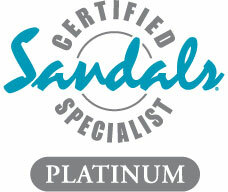 Sandals Resorts is an experience of all-inclusive excellence in the Caribbean. Sandals delights couples in love with supremely luxurious accommodations, gourmet candlelit dining for two, gorgeous tropical settings and some of the world's most exquisite beaches. Sandals Resorts created for 2 people in love. Free Fitness Center and Free Wi-Fi. Visit our other website, Twinsburg Vacations. Twinsburg Travel will offer you the lowest price on your vacation. If you do find a lower price, just let us know, and we will make our price your lowest, period! We will match any promotion give away! Twinsburg Travel in business since 1994. Copyright © 1996 - 2018 by Twinsburg Travel. This page last updated on February 7, 2018. All rights reserved.